To Order Stain Solver, visit the Stain Solver Store. Click on this link to go the Stain Solver Order page. The 9.2 Pound order of Stain Solver is perfect for deck cleaning and to get patio, rooftop and cedar siding cleaning underway. 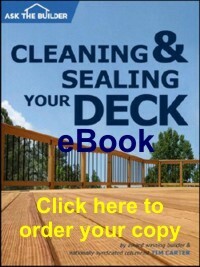 We find that the average deck - 15x15 - requires a minimum of 4 Pounds of Stain Solver. This does not include the railings. If you have railings on 3 sides, you would need another 2 Pounds of Stain Solver. The 9.2 Pound Stain Solver is sold in a one-gallon container. Stain Solver cleans virtually anything that is water washable! Stain Solver will make things look like new. If you want to work hard while cleaning things, go buy from one of my competitors. Stain Solver should ONLY be used by people who want the highest-quality. To learn all the things Stain Solver can do for you, simply CLICK HERE. Have questions about Stain Solver? Visit our Frequently Asked Questions page. All natural, all purpose Stain Solver is a powerful, non-toxic oxygen bleach cleaner that creates millions of oxygen ion bubbles as soon as the powder is added to water. These non-toxic oxygen ions blast apart stain and odor molecules. My Stain Solver is made in the USA and contains the maximum amount of active ingredient as allowed by law. The raw materials that are used in the active ingredient are so pure they are registered by the FDA as food-grade quality! You can't get any purer than that. How Does Stain Solver Work? Stain Solver is mixed with warm water. Once dissolved, you simply soak articles or apply the Stain Solver and water with a sprayer, mop or brush. The best part is that Stain Solver works on its own. Wood decks come clean in minutes. Many clothing stains disappear in several hours or after a simple overnight soaking! Scrub most articles lightly after Stain Solver soaks and rinse with a hose or running water. No need for destructive high-pressure power washers! Shipping Notice: Stain Solver can only be shipped by ground, regulations prohibit Stain Solver from being shipped via air. Shipments to the lower 48 States are subject to FREE SHIPPING. Shipments to Canada are available as UPS Ground shipments. However these shipments are not part of the FREE SHIPPING program. Rates to Canadian destinations are based on UPS Ground shipments to those areas. Click here for a map showing the estimated UPS Ground Shipping Time from the AsktheBuilder Store. For any Stain Solver order shipped to Canada, you could be charged additional fees, such as local taxes and brokerage fees. These may add considerably to your cost. These are not calculated in our shipping charges. Contact your local customs department, or UPS, to determine if there will be additional charges, before you place your order. Click the button below to add the Stain Solver Oxygen Bleach (9.2 pounds) to your wish list.